I mean seriously, if you make me love characters enough, I will devour scenes where they just sit around and talk, but I have to admit, plot is imperative to make the story move forward. Can the character have an arc without a real journey? But what do the journey and the arc matter if you don’t even care about the character in the first place? When I read Harry Potter and the Deathly Hallows it was just amazing to me how Rowling pulled this off. I had gotten to know these characters and were already attached to them from previous books, but through their circumstances they grow leaps and bounds just in this one book. Their journey felt complete. Characters help connect me to the story. 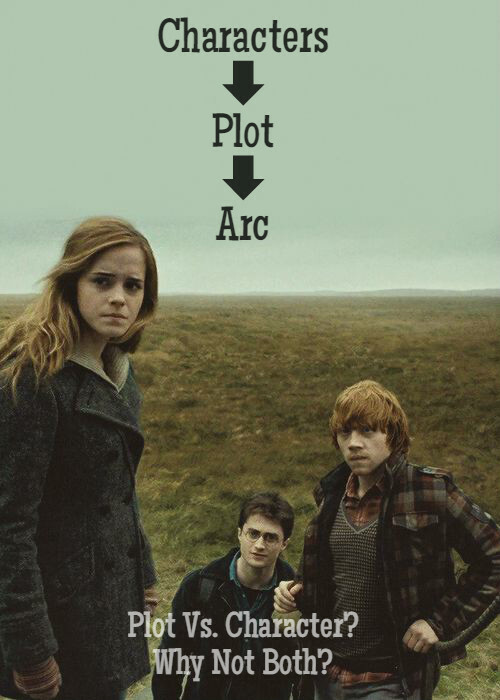 The plot moves the characters through an arc. And if the arc is successful and I see positive change on the other side (or really well executed negative change), then I am ultimately satisfied with the story. Do you consider yourself more of a plot person or a character person? What do you think matters most in a story/character arc? 10 Responses to Discussion: Plot Vs. Character? I hate to say it, but the best books have a healthy mix of both. I can’t say I like one more than the other, just that if it is uneven it is distracting. The type of books that defy this though are ones that are character stories where the plot is mostly low key and instead drives internal conflict where the character grows that way. When I read those types of books and still really enjoy them, I think it just boils down to excellent writing. But arcs are important, and I definitely judge the books on whether the character grew, changed over the story. Great topic! You make a good point about how internal conflict can really move a story and character forward as well. I also think with movies I lean more on the plot than the characters, though I do want to like them on some level. But that is an interesting thought about fairy tales! But yes, I definitely appreciate good retellings where both shine, especially The Lunar Chronicles! Marissa Meyer can really craft great characters! I definitely like character-driven books, but it’s true that there needs to be some kind of plot – they need to be going somewhere. I do lean more towards the character side though. Sometimes, I can be fine with just one. One could always compensate for the other, but I truly love books where there’s a good balance of both the plot and characters. I don’t really have a preference, and it always depends on the book I’m reading, but I always hope that the book has both. I’m definitely a character reader these days. While I think every story needs an intriguing (and comprehensible) plot, and there have been many books that I’ve liked solely because the story itself was intriguing, if you want me to LOVE a book, and get OBSESSED with a book, then it’s all about the characters. I will forgive SO MUCH in a book if the characters are to-die for. I mean, think about Harry Potter! If you weren’t interested in the characters, all the camping and wandering around looking for stuff in Deathly Hallows might’ve been preeeeetty bland. But you want Harry to succeed, you want to know more about Dumbledore, you want to see Hermione just DOING STUFF — if I love the characters, I don’t care as much if a book has plot holes, or slow scenes, or even lazy writing at times. Whereas, if the characters are flat or bland, the rest of the book had better be flawless, because it’s got to overcome quite the hurdle. I don’t think there’s ever been a book or series that I’ve got invested in JUST because of the plot. High stakes don’t matter if you don’t care about the characters that are in trouble! But there have definitely been so-so books that I’ve gotten in DEEP because I love the characters themselves and want to see what happens next. So, yeah. Character over plot all the way. You make good points, and I agree! I totally agree – character is what makes plot interesting. Plot is maybe what makes the characters exciting – their arc and the events that reveal the characters. I’ve learned a lot from Maggie Steifvater’s blog posts on using plot to reveal the characters. Trying to implement it in my own writing has made working with plot both easier and more interesting. And it makes it easier to see character arc and make sure you move them through that.